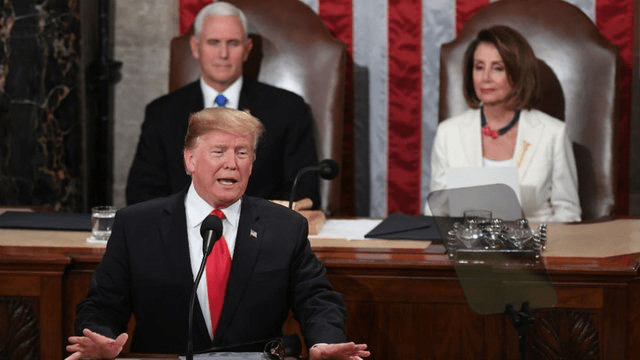 Donald Trump delivers his 2019 State of the Union…. I just couldn’t watch the guy…..
As President Trump veered into immigration, partisan tension soared. With 10 days left for Congress to pass a border security package and avert another government shutdown, Mr. Trump devoted a significant portion of his speech to making the case for his signature campaign proposal: a wall at the southern border. “This is a smart, strategic, see-through steel barrier — not just a simple concrete wall,” he said, adding, “Simply put, WALLS WORK and WALLS SAVE LIVES. But as Mr. Trump raised the time frame to keep the government fully funded, the Democrats tensed and Republicans continued to applaud. Representative Ilhan Omar, Democrat of Minnesota, buried her head in her hands. As he detailed a litany of familiar talking points about caravans marching toward the United States, there was a disgruntled round of groans, punctuated by a couple boos as they looked around at each other, shaking their heads. Representative Veronica Escobar, Democrat of Texas, whose district includes most of El Paso, was visibly angry after Mr. Trump referenced her district and the decrease in crime. She appeared to mouth that it was safe before the wall and after the wall. “Oh my God, oh my God,” she mouthed to her colleagues, her arms crossed as other representatives looked over in her direction. The women in white took their bows. The audience for Mr. Trump’s State of the Union address looked like a striking sea of white, with Democratic women — many dressed in white in a nod to the women’s suffragist movement — sitting together. Midway through the president’s speech, they did something completely unexpected: They stood up and cheered. “No one has benefited more from our thriving economy than women, who have filled 58 percent of the newly created jobs last year,” Mr. Trump said, prompting the women to roar their approval. After all, many of them had new jobs, in the House, which they took from men. “You weren’t supposed to do that,” the president said, smiling. President Trump delivered his second State of the Union speech on Tuesday, imploring lawmakers to “break decades of political stalemate” and “heal old wounds” just weeks after the longest government shutdown in history. Mr. Trump’s speech was his first address to a joint session with one House controlled by Democrats. His remarks came as Congress works to craft a deal on border security to prevent another shutdown before a looming mid-month deadline…. Trump did NOT announce a ‘national emergency’ at the Southern Border to enable himself to move ahead with stealing money from other programs to build a concrete /steel wall….